Green architecture, modern design, and Bluffview setting. The result is a dynamic home, environmentally sound, one that is bold and graceful, and a home that celebrates the attractiveness of the Bluffiview neighborhood. Whether it is geothermal conditioned air and heat, a natural thermal chimney, or the use of energy saving or renewable materials, this Gary Olp designed home has been celebrated as a landmark for the direction of architecture and construction. Rather than a democratic distribution of space among three bedrooms, this home emphasizes the open public spaces on the first floor and the private master bedroom suite and balcony on the second floor. In addition to the master bedroom suite, there are two bedrooms, another full bath and an office on the second floor. A full bath on the first level can also be used as a cabana bath. A simple structure and outdoor shower relate to the pool. 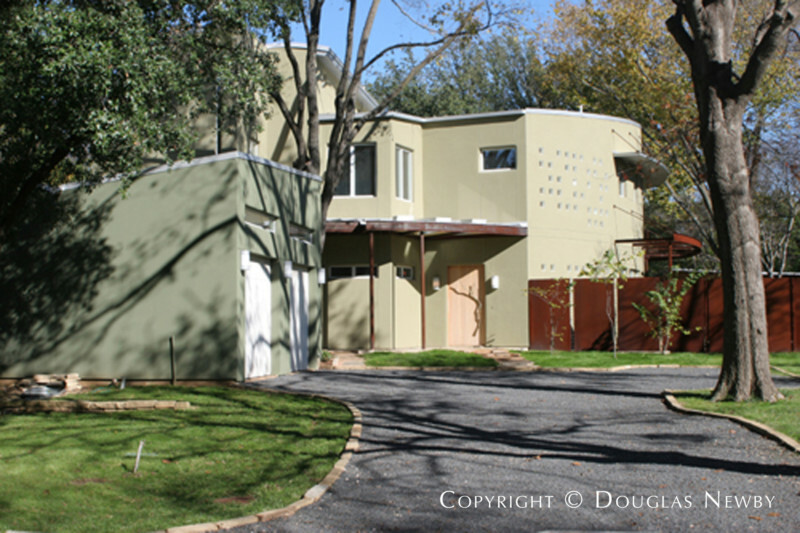 Architect Gary Olp designed and oriented this architecturally significant home to take advantage of its Bluffview site. A narrow east-west axis minimizes the west harsh sun and captures the soft sun from the east and the south through walls of tall vertical windows. The cross ventilation is accentuated by the stack effect of the thermal chimney, siphoning hot air through the clerestory windows. The curvilinear wall of the stucco exterior is pierced with asymmetrical patterns of eight inch square openings visually balanced by the eleven eight foot operational vertical windows. A continuous horizontal band unifies the windows, pierced opening and doors throughout the first floor. The exposed, rusted structural elements were allowed to oxidize to deliver a warm patina in contrast to the clean lines and smooth finishes of this home. 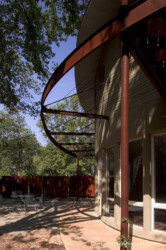 You will see this rusted finish on the architectural elements that include the eyebrow awning made up of segmented metal panels that wrap around the open-air porch and a stepped steel wall creating two-foot columns of light while providing privacy and security. The open kitchen, living room and breakfast room look into the canopy of trees and over the lawn and pool edged in stone. A volume of three-dimensional shapes that recess, protrude, curve, slope, cut away and intersect make this space visually dynamic. Equally pleasing and dramatic are the overlapping slabs of undersided, frosted, illuminated edged glass found on the countertops over the 200 year old Korelia maple used for the veneer over the American maple cabinets. The juxtaposition of organic material against stark stucco finishes and geometric lines can be seen in the front door where a crepe myrtle branch cast in bronze is used as the pull. Interior rooms were designed for their purpose. 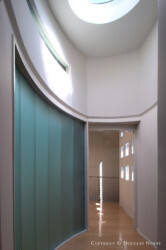 The series of glazed openings both illuminate the hallways and decorate the bamboo floors with square splashes of light. 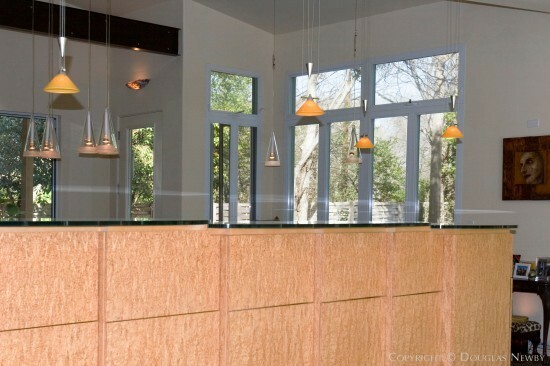 The success of this modern home comes from the juxtaposition of both regimented and random play of geometric shapes accentuated by organic shapes and materials, smooth stucco surfaces, controlled and spontaneous light that illuminates the home and decorates the surfaces; technology and an environmentally savvy construction within a rustic setting. You will enjoy this approximately 3,600 square foot home on over half an acre of land. If you are interested in this home, Bluffview real estate or another Dallas featured listing exemplifying the best of architect designed homes, please contact me, Douglas Newby, at 214.522.1000. 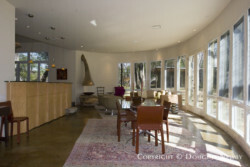 Douglas Newby represents clients with Dallas estate homes, architect designed homes and modern homes.